Norton Rose Fulbright is a British international law firm with 3,800 lawyers in over fifty cities on six continents. Norton Rose Fulbright advised MASEN, the Moroccan Agency for Sustainable Energy, on the Noor solar program and on the issuance of Morocco’s first green bonds to finance this program. In addition, Norton Rose Fulbright, in consortium with Attijariwafa Finance and Roland Berger, was selected to lead the IPO/partial privatization of Morocco’s main ports operator, Marca Maroc,which operates the ports of Laayoune and Dakhla. 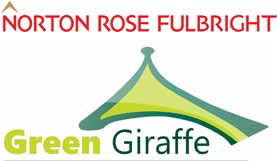 Green Giraffe is a Netherlands-based, European-international financial renewable-energy advisory firm with offices in Hamburg, Utrecht, Paris, and London. In 2015, Green Giraffe provided strategic advising to MASEN in preparation for MASEN’s NOOR PV I tender for 3 energy projects, with a total capacity of 170 MW, located in Western Sahara. Norton Rose Fulbright, Homepage, http://www.nortonrosefulbright.com/; Norton Rose Fulbright, “Fact Sheet,” January 2017, http://www.nortonrosefulbright.com/files/media-information-norton-rose-fulbright-factsheet-72508.pdf. Norton Rose Fulbright, “Norton Rose Fulbright advises MASEN on Solar Programme and First Green Bond in Morocco,” November 23, 2016, http://www.nortonrosefulbright.com/news/144752/norton-rose-fulbright-advises-masen-on-solar-programme-and-first-green-bond-in-morocco; Legal Monitor, “Norton Rose Fulbright Advises MASEN on Solar Programme and First Green Bond in Morocco,” November 25, 2016, http://www.legal-monitor.com/news/norton-rose-fulbright-advises-masen-solar-programme-and-first-green-bond-morocco. Sogecapital Borse, “Semestriel Marche Boursier,” June 30, 2014, https://www.sogebourse-net.com/DOCUMENTS/Analyse_Et_Recmmandation/Revue_semestrielle_-_Juin_2014-.pdf.